Aloo chat is the most basic type of Indian subcontinental savory snacks (chaat) (also spelled alu chaat). Tradtionally, it’s made from deep fried potatoes (aloo) served with vegetables and chaat sauce, which is usually made from yogurt. This recipe is dedicated to my cousin R’sha, who is studying in a sleepy Midwestern town. She is a big fan of aloo chat. During her last visit we made samosa chat, she asked me to show her a basic aloo chat recipe with everyday dorm ingredients. 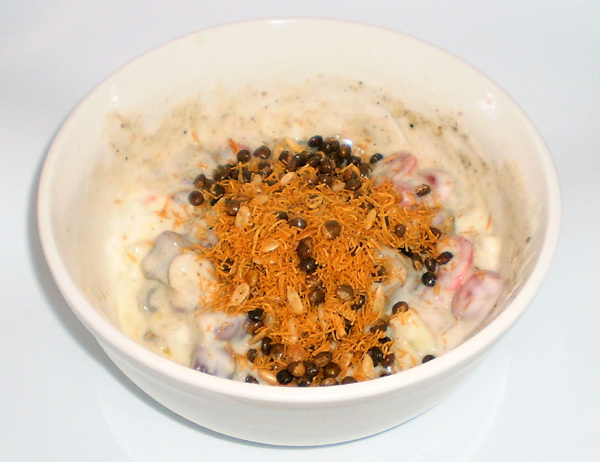 A good chaat contains savory, salty, sour, and sweet flavors in a perfect harmony. It also has a velvety smooth sauce encompassing soft and crunchy fillings. Here’s how to make a simple aloo chat. Get home fries, sprinkle with pinch of garam masala and mix. Or, cut a potato (slightly larger than egg-size) into small cubes (few cms) and coat with a teaspoon of oil, salt and pinch of garam masala. 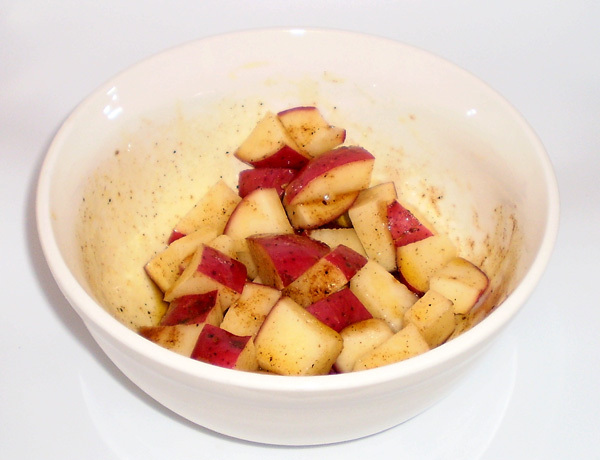 Here I used red waxy potatoes and mustard oil, which gives a pungent aromatic flavors but any fat would work. Microwave three times, for 90 second each, while stirring in between. 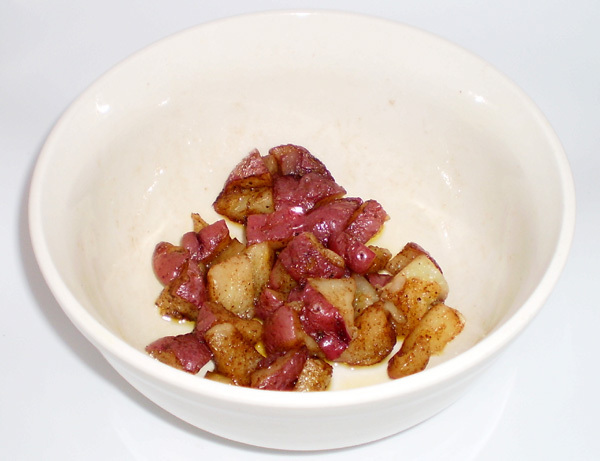 If using home fries, microwave only once. Let it stand for at least 15 minutes. Cooling potatoes before adding yogurt and other ingredients is essential. 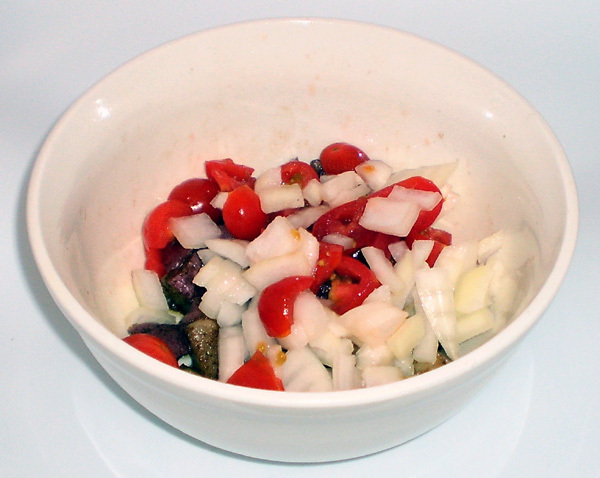 Add chopped onions and tomatoes. Other highly recommended toppings are cilantro and canned garbanzo beans. Here I used yellow onion and grape tomatoes. 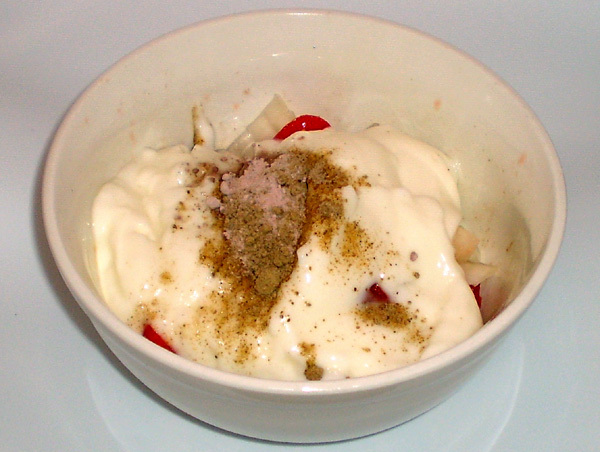 Add unflavored and unsweetened plain yogurt. Add chat masala (alternate any curry powder), black salt (substitute with salt, black salt gives a pungent flavor), a few drops of lime juice. If you don’t have traditional sweet tamarind (imili) sauce, add honey. Mix and top with any crunchy Indian subcontinental snack such as, papad, aloo bhujia etc. Here I used dal biji. If you don’t have any crunchy subcontinental snacks, use plain potato chips. The goal is to have crunchy bite to the chat. Play with the all the flavors; salty, sweet, and sour, until you get a perfectly harmonious aloo chat customized just for you!